You will earn 2,418 Reward Points. Earn 1 reward point for every 1 dollar spent. The patented Hatco Flav-R-Savor® Heated Air Curtain Cabinet effectively and safely holds hot food hot without the use of doors, allowing immediate access to product. Warm air at the front of the cabinet is forced downward, through ducts above the opening, forming a “curtain” of heated air. A portion of the heated air is drawn toward the rear through special perforations on the back wall, warming each pan. 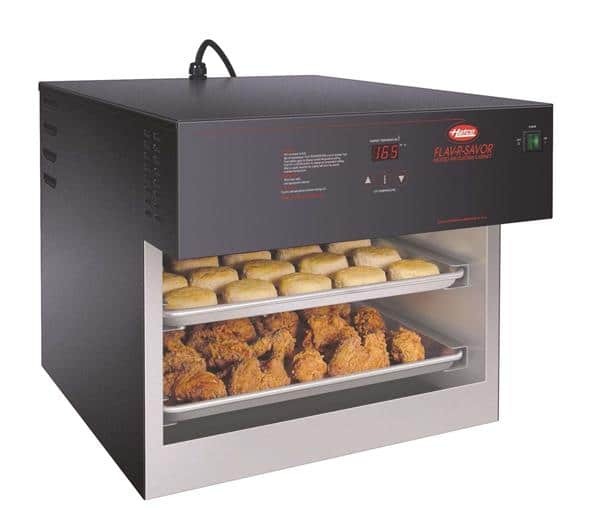 The patented Hatco Heated Air Curtain Cabinet is ideal for holding wrapped products like tortillas, burritos and ribs, as well as products on sheet pans like biscuits, chicken, hamburger patties, pizza and baked potatoes. Holding temperatures range from 80°F to 175°F (27°-79°C).